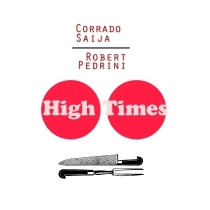 The EP “High Times” is the first result of his collaboration with Robert Pedrini. Working on this EP Corrado and Robert were focussing on the best of the 90’s sound in memory of the jazzy and fusion influences mixed with club electronics. This album was born of the true spirit of playing with music – with easiness and playful creativity – remembering some instances of European “Nu Jazz” and “Downtempo” sound with a slight taste of Detroit’s „Garage“. Corrado Saija is a composer, musician and sound artist from Italy. He started learning the piano, percussion and the rudiments of computer music all by himself and then started following courses at conservatory of music in Milan. He works in music since 1999 when he was 17 years old. He is a poly-instrumentist and an electronic music composer as well as sound designer. His musical life is in between experimental music, free jazz, electro-acoustic improvisation and an amazing world of easy listening, lounge and exotica music. Corrado composes music in order to realize multimedia installations for contemporary theater, live comment for black/white old movies, art performances in galleries and audiovisual work like film and documentary. The EP “Settembre” is his first music album that he has entirely produced and he is proud to release it with “Lemongrassmusic” in March 2013.